Photo of model Description Large wholesale, UAH. WHOLESALE (regular customer),UAH. Retail, UAH. 2. Individual street lighting project on solar batteries. 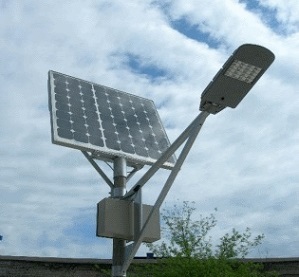 Energy-saving LED street-light luminaires powered by solar panels. As we all know in our country almost every year the cost of electricity increased by approximately 15 – 20%. Our company “SYSTEM OF ELECTRICIAL PROTECTION” offers you to not only be independent of the various energy companies and suppliers, but also to reduce the cost of electricity, or forget about it altogether. All of us have been accustomed to comfort, and it is not acceptable to us, uncomfortable, and dangerous to be in the darkness on the non-lighting streets. 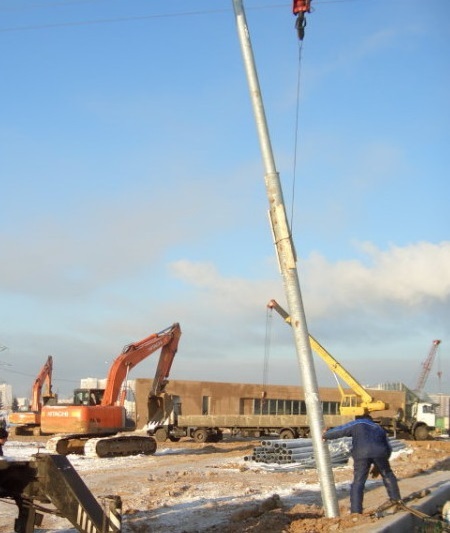 But in view of the current situation, unfortunately, it is not everywhere installed lampposts, and if they are present, they are probably decoration, but not the equipment, the main function of which is to light the territory. It is also necessary to consider the unfortunate fact, that our authorities are trying to save energy and shutting off lights in some places, because of which our streets are also staying not illuminated. 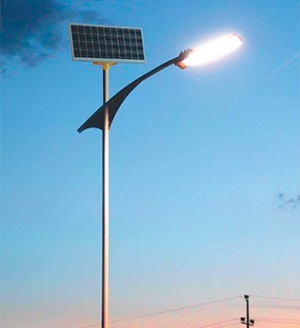 In the present situation, according to many experts the best solution may be a street lamps with solar batteries. Alternative and renewable energy sources are used for a long time and rather successfully, so why do not use it to illuminate both city streets and everyday life? Also there is a question about how to connect to the network. Sometimes it is very expensive to transfer electrical energy to distant place, which is used to illuminate territory on the standard network. These places can be difficult to mountainous areas, beaches or ocean, rural settlements, and the residential areas of the city which have worse geographical location. The minuses of old technologies also include material cost, such as: poles, wires, substation and electric meter, cabling, settlement of overhead networks and obtaining various permissions which sometimes exceed the cost of materials and works inclusive. 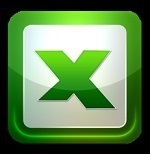 So, we turn to innovative solutions that will help you solve all the problems! Luminaires, which we offer to your attention, work on solar-powered and that is their main advantage. In view of this fact, they do not require absolutely no connection to the central power, and therefore for the installation you do not need any permits, quotas, various approvals and undergo various checks. Also worth mentioning is the low cost of installation by our specialists, which practically equalizes the final cost of the traditional lamp with our products. One of the pleasant bonuses would be the fact that after installation you do not need to pay monthly electricity bill! How does the lamppost work? First, we tell you about the composition of the solar battery, which is a basic element in our design. The battery is made up of photovoltaic cells that are exposed to sunlight and generate electricity. The converted electricity comes from solar panels and subsequently stored in the battery, from which the LEDs are powered, built-in luminaire. Also, our design has a special control unit, the main function of which is automatic on / off the flashlight on solar batteries at the right time of day. An additional feature of the control unit is a battery charge control. 1. The solar panel. It has a primary function to convert solar radiation into electricity. 2. The battery that stores electrical energy. It should be noted that from the technological point of view, the greater the capacity of solar panels the greater the amount of energy will be converted and later will be accumulated. Also, another aspect is that the higher the capacity of the battery, the longer the light will shine at night, but on the other hand will be more expensive whole structure. 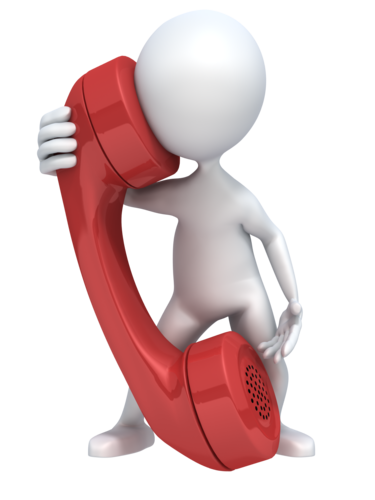 Our experts will pick the best option for your city, region or at home. Using the experience and wishes of the client, we can provide a street lamppost variety of additional functions. One example is the level of the control function of the luminous flux, that is, in the standby mode, the lamp will shine by 25-50%, and only when it detects any movement of the light output will be increased to 100%. This will extend the lamp life activity and save power supply. As an example, one more important light sensor function which will gradually turn on at dusk and turn off at dawn. Advantages and disadvantages of “solar” street lighting. ♦ Absence of any electricity costs. ♦ Installation is carried out in hard-to-reach places and areas where there is no centralized power supply. ♦ The simplicity and speed of installation, because it does not require any laying of transmission lines, cables, obtaining certificates. ♦ Safety and eco-frienliness during exploitation / utilization. 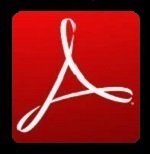 ♦ Durability – the minimum service life is determined by the most “short-lived” element, which is the battery,and its service life is 10-15 years. ♦ Automation process robots. Turning on and off and recharging performes automatically. ♦ Simplicity and ease of use. ♦ Lamps powered by solar panels – absolutely safe for humans, which is confirmed by multiple certificates and licenses of the manufacturer. ♦ LED lamps practically do not emit ultraviolet, so LED devices do not need to be cleaned so often from insects. • Dependence on the weather. But there is not so bad as it seems at first sight-our panels catch not only direct rays, but diffused light. • Solar-powered lamps cannot substitute full street lighting. They will not give as much light as the lights on highways or spotlights. And if you put high powerful systems, then their cost will not be small. The company “SYSTEM OF ELECTRICIAL PROTECTION” offers a new line of LED lights that work completely regardless of local power systems. The set of independent lighting system 20 / 40W without support, which is installed on the existing poles with a diameter of 76/89 mm. This system set is used to replace traditional street lights. Power is supplied directly from the network. Autonomic park LED light, which is directly designed for lighting parks, squares, boulevards, pedestrian paths. As previously we noted that the autonomic lamp automatically turns on, and using the energy stored in the battery, illuminates the road surface every evening. Also there is a built-in motion sensor, where the lighting will be turned on at full power when a person approaches to a distance of 7 meters. Full automatic operation of the luminaires is achieved after a primary eight hour charge. – aluminum support 2.2 meters high with a solar panel and controller, waterproof design. – switch of operating modes. 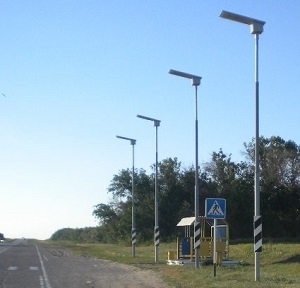 Autonomous LED street lamp, using of which is intended for street lighting, courtyard areas, car parks, footpaths and bus stops is designed taking into account climatic features for operation in Ukraine. A fully charged battery provides autonomous operation of the system up to 5 hours a day in the absence of the sun. • 60 W and more. During installation in accordance with the existing project or during writing of project and launch an autonomous lighting system into operation the company “SYSTEM OF ELECTRICIAL PROTECTION” carries out all the necessary work on a turnkey basis.